Water is the Elixir of Life and the Most Common Element in Your Body. You can survive a maximum of 3 days without the intake of water, assuming you are at sea level, at room temperature, and a relative humidity of above 50%. These conditions are unfortunately very rare during wilderness survival situations and non-existent during most Canadian winters. Do not underestimate the bodies need for water in order to function properly. Many Survival Situations have been made much worse than they need to be or even fatal, simply by the lack of water consumed by the participants. After keeping warm the consumption of water is your next most important priority in most cold weather survival situations. To survive your bodies Water Loss Must Equal Water Gain. You must make up for all water used to digest your food and that which is lost to perspiration, respiration, and urination. In normal conditions at sea level, room temperature, and a relative humidity your body loses water to various sources each day: ½L to Perspiration, ¼L to Respiration, 1/8L to Defecation, and 1 to 2L to Urination. Exercise, Respiration, Perspiration, and Altitude all add greatly to water loss each day depending on your activity level and the temperature. The minimum amount of water required to survive is 2L per day. Outdoors in cold temperatures your water loss will greatly increase. The colder the temperatures and lower the humidity the higher the water loss will be. If you are thirsty, have a headache or do not urinate at least 1L of water each day you are dehydrated. Remember it is very easy to fool your thirst by drinking just a little bit. Your Body Requires About 4L Water or other liquids each day in the Wilderness to Avoid Dehydration and to Keep your Body Functioning properly. Dehydration will greatly affect your endurance. Your endurance is the one factor most counted on to allow us to live through a survive situation in the wilderness. Drink at least ½L at each meal and 3L during the day when in the wilderness. Your goal in a wilderness trip or survival situation must be to stay hydrated at all times. Remember your body does not absorb all of the water you drink unless severely dehydrated. 300ml of water is sent to the urinary and digestive tract for each 1L consumed. 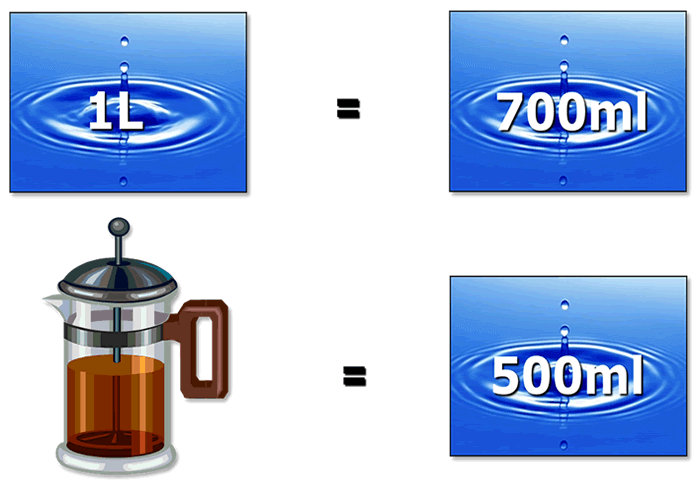 500ml is sent to the urinary and digestive tract when you consume caffeinated beverages, such as coffee. This is an important consideration especially in winter when we tend to consume more caffeinated beverages. Don't take chances with hydration. Do not ration your water; it is better inside you than in your canteen or thermos. Push yourself to drink as much water as you can while on a wilderness trip or while stranded in the wilderness in a survival situation. Many survival situations can be made much less demanding on your body by simply keeping hydrated. Make keeping hydrated part of your daily routine. 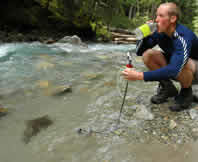 If possible drink 4L of Water or other liquids each day while on a wilderness trip or in a survival situation.